When January 1 hit, we got some good news – and some bad news. The good news is that we’re finally back in an employer-sponsored health insurance plan. As I reported in the middle of last year, we’ve been on a COBRA plan for the second half of 2017, paying a monthly premium of $1,875. But my wife’s part-time job since became full-time, and brought a new plan. Our new premium is down to $400+ per month. That’s blessed relief. The bad news is it comes with a very poor prescription plan. But I think we found workarounds for high prescription costs. We needed to. My wife and I are both on prescriptions, me for cholesterol and high blood pressure, and her for type II diabetes. Needless to say, prescriptions have become a part of our lives. It happens when you get north of 50. GoodRX.com – The Ultimate Workaround for High Prescription Costs? The hospital network in our area has an excellent outreach program. They appoint a nurse coordinator to anyone who has used the facilities. The coordinator acts as a point person to help you navigate the complex healthcare and health insurance systems. I’ve never experienced this before, and it’s a welcome service. When I explained to the nurse coordinator that our new prescription coverage is poor, she promptly recommended a website that can help. GoodRX.com is prescription medication aggregator, that provides you with the best prices in your area. That’s good news. Under our previous employer plan, including the COBRA, we typically paid no more than $10 for prescriptions (and frequently less), to a maximum of $50 for recently released name brand drugs. Of course, those are just the co-payments. The actual cost of the meds are many times higher in each case. Under the new plan, the minimum is $20 for the least expensive generics, but up to $200 for the newer name brands. If you’re on two name brand meds, you’re paying the equivalent of a car payment, just for the co-payments. What GoodRx.com does is provide you with a list of each medication offered by providers in your area. This gives you an opportunity to comparison shop, without having to research individual pharmacies. You can choose the source that offers the best price for your situation. The screenshot below shows the availability of Lipitor (generic, Atorvastatin). Neither my wife nor I are on this med, but it is a common one. When you enter it in GoodRx.com, you get a list of each pharmacy in your area where it’s available. It provides both the cash price and the discount price that are offered by each provider. 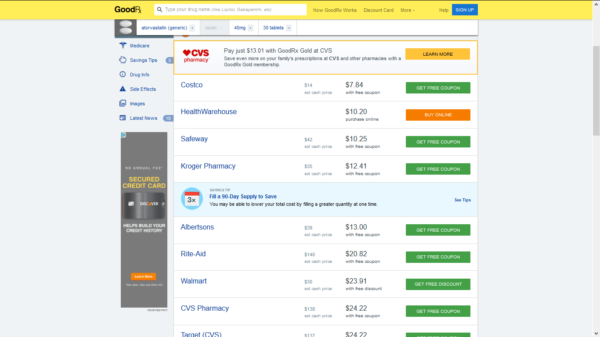 Based on the results of this search, the least expensive option for Lipitor is CVS at $13.01. Now if you look further down the chart, you can see that the popular chain pharmacies, Rite Aid, CVS and Walgreens (not shown), have a cash price for the drug at around $140. If you use your prescription plan, the price you will pay will be based on the cash price. On our plan, that could mean that you’ll be paying a minimum of $40 per refill. The moral of this story for us is that your prescription plan isn’t always the least expensive way to get the meds that you need. It can actually be cheaper to purchase them outside your plan. Now one thing you do have to be careful of with GoodRx.com are the orange and green boxes on the right-hand side of the page. They give the special stipulations that come with the discounted prices. 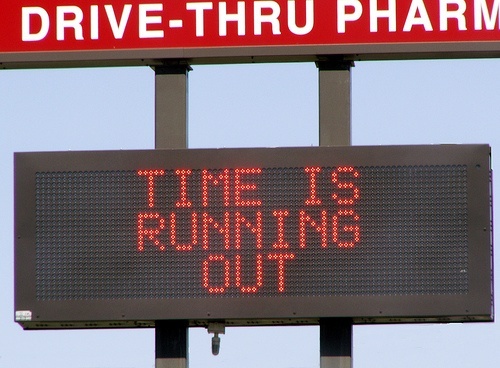 If the button is green, it’s a one-time discount. For example, you can purchase Lipitor at Costco for $7.84 – but that’s only the first time you buy it. In the case of CVS, the orange LEARN MORE box reveals that you have to enroll in the GoodRx Gold membership plan, at a cost of $9.99 per month. That gets you the discounted price on a permanent basis. But it also enables you to purchase other meds at discounted prices through CVS and other pharmacies. But you don’t have to go that route either. Pay close attention to the cash prices listed. The search reveals that the cash price for Lipitor at Costco is normally $14. That’s an even better deal than the CVS discount price, and it’s permanent. Knowledge is power. This is a program that I was already aware of, but the nurse coordinator presented it as well. Most of the big box retail chains that have pharmacies offer a $4 prescription plan. They also typically offer $10 for a 90-day supply ($4 covers a 30-day supply). The $4 prescription plans generally apply only to generic maintenance type medications. The discounted price level does not apply to recently released brand-name meds, the kind you typically see advertised on TV. The pharmacy chains also have flat price generics, though they’re not as inexpensive. For example, Walgreens has 30-day supplies ranging from $5 to $15, and $10 to $30 for a 90-day supply. There’s also an annual membership fee of $20 for individuals, and $35 for families. For what it’s worth, I got my first prescription filled at Walmart for $4. I had been paying a $10 co-payment under the previous plan. It never occurred to me to look into less expensive options. It turns out that I didn’t even need to use health insurance for this particular med. And that’s really the whole problem. We get into a health insurance plan, and assume “they know best”, and have everything covered. That’s almost always a misguided assumption. I’m guilty of making it, even though I know better. But with healthcare costs rising across the board, we always need to find less expensive ways to get the services that we need. That’s true even if you have a health insurance plan. It’s probably not an exaggeration to say that health insurance makes us all lazy. We stop looking for better deals. As I’ve been saying, the discounted prices apply only to generic meds. If you’re on a new name brand drug, you’ll be stuck paying a higher price. But as is the problem with our coverage, the co-payment alone can be as high as $200. There are workarounds for that problem too. The manufacturers of the newer name brand drugs are well aware of the affordability issues. They typically offer discount programs to make the meds more affordable. An example of a common name brand med is Jardiance. It’s used in the treatment of type II diabetes. The drug has a cash price in the $500 range. The co-payment can be anywhere from $50 to $200. That’s a tight squeeze on top of a monthly health insurance premium. To soften the blow, Jardiance offers a discount program that enables you to get a 12-month subscription with a co-payment. At the end of 12 months, you can renew the discount for another 12 months. After a couple of years – hopefully – a generic substitute will be available at a much lower price. The catch with these discount plans is that they only work in concert with a prescription drug plan. Jardiance will cover the cost of the co-payment, up to $250 per month. But it’s not offered if you don’t have a prescription drug plan. The only alternative if you don’t is to switch to a generic alternative, which may not be as effective as the name brand. I suspect pharmaceutical companies don’t make this offer because they’re being charitable. They know that if affordability is a problem, then the new med will not be well received. After all, people won’t pay for what they can’t afford. By offering discounts, pharmaceutical companies are expanding their market penetration. I realize that these workarounds can be more complicated and less convenient than simply going with whatever your prescription drug plan is offering. But as I’ve said many times in the past, there are no perfect health insurance plans anymore. The noose is tightening as the cost of healthcare continues to rise out of all proportion to the rest of the economy. There’s little chance that health care will be reformed – that is, truly reformed – until it completely blows up due to its own excesses. That day is coming. Healthcare is gradually sucking the life’s blood of the US economy, and particularly the middle-class. Though it’s not discussed in the media or in political circles, that means that the current healthcare system itself is on life support. But until it blows up, and is replaced by something more workable a long-term basis, all we can do is muddle through. It’s a relentless effort to save nickels and dimes while costs are rising in dollars. But what choice do we have? Do you have any other suggestions for workarounds for high prescription costs? ← High Risk Auto Insurance: How Much Will It Hurt Your Wallet? My MD is pretty conscientious about Rx cost. He prescribed regular niacin instead of the more costly Niaspan and is very open to prescribing a larger dosage which is sometimes less expensive, and then having me cut the pill in half if it is possible to do so. He also believes that some of the older medications that are cheaper do just as good a job as the newer ones. They are cheaper because they don’t have to absorb advertising costs and the R & D expenses have already been recouped. My insurance plan also allows mail order purchases which is sometimes less expensive but you have to remember to order it timely instead or simply running down to the corner Walgreens. Hi Kathy – Our new plan is offering mail order, but I’m not sure it’s cheaper. What disturbs me is how these plans are a matrix. You read the guidelines, then have to do a test run to see how it REALLY works. Anything we can order from outside the plan I’m open to. My doctor has done something similar with doubling or halving the dosage to make it less expensive. Thank goodness for professional cooperation! The upside of all of this of course it that we’re getting a solid lesson in alternatives. I’m always up for learning something new, especially if it will cut costs or expand income. I’m a self-styled life-long student, and proud of it! Until this past October when I was employed full time, I had a ‘killer’ health care and med plan. I’m now on my Husband’s HSA. While it is still coverage it isn’t what I was spoiled with at my 9-5 employer. First thing I did was cry to my pharmacist as to what I was going to do. She was a plethora of good info including GoodRx, samples from your Dr, and even consider some homeopathic route. We are not on very much but the change was eye opening. I’m so glad your wife was able to become full time and provide you each with some coverage. BTW, Husband and my background is in mortgage banking-I was thinking yours was as well? Kudos to you for thinking outside the box and doing this blog. We just love it! Hi Ruth Ann – Yes, I’m a refugee from the mortgage business! I went into blogging because in 2008/2009 there was nowhere for a mortgage refugee to find a job. I wasn’t going to try to wait it out either. I had soured on the industry years before. But thanks to the Mortgage Meltdown, I found my true calling in life, and I couldn’t be happier. The experience taught me to seek salvation outside the box, and to distrust The System and it’s increasingly empty promises. I believe we’re all better and more capable and competent than we think, or are led to believe we are. We begin to move forward when we learn to trust ourselves and begin taking chances. But I suspect this medical “journey” will be an ongoing experiment for the foreseeable future. Stay tuned for more medical posts! Congratulations on your wife’s job and the money saved due to the new Medical Plan(s), that is fantastic! My husband had high blood pressure also and no medical plan. He won’t obtain anything until 6 more years when Medicare kicks in. He’s lost 10lbs by cycling with me. He also drank green tea (very cheap to buy) and ate much less meat. He loves Meat so this wasn’t easy. His high blood pressure went down. Now he’s borderline but we’re still working on it. We now live in Snow Territory so exercising is a challenge during winter. There is no food in our house so we only eat out once a day. Living in Sierra City, Ca. the restaurants have limited days and hours during winter as does the tiny store. So we just starve in between, it’s GREAT!!! the only things here are fruit and vegetables, oatmeal, and some nuts. He had ringing in his ears so he was at risk of a heart attack when he refused meds. Something drastic needed to happen. Doctor made him come back in 5 days showing he’d lost weight or be forced on meds. He lost weight. Then had to keep coming back once a week showing progress. At that time he was eating alot of garlic and oatmeal for breakfast which helps. We planned on taking advantage of Red Rice Yeast which is one of the main active ingredients in Lipitor (called Statins) but haven’t needed to by any as of yet. Must order it online from outside the US to get it since the US banned it due to greed. Some folks wouldn’t buy Lipitor if they just substituted it for a natural Statin yeast. No doubt it’s probably cheaper and healthier. My husband weighs 190 now, actually 188 since he lost 2lbs from being sick this last week. Hopefully he plans on keeping that 2 lbs off too. Needs to get out of that “borderline area” or he’s out already just by a smidgid. Your website is a blessing to me. I greatly appreciate your moral character. Sorry I want to add it is Red Rice Yeast, not Red Rice. It contains a natural Statin found in Lipitor, the main ingredient in this blood pressure medicine. The Rice won’t help you lol! Feel free to type in the word yeast in my post here if you’d like to post it. Hi Erica – Thank you for your kind words, though the moral character part is a tough act to follow. As a Bible-believing Christian, I ascribe to what C.S. Lewis said, that “we’re all snow covered dung” – incurable sinners in desperate need of salvation. If any evidence of moral character flows from me, it’s living proof that God works in mysterious ways 😉 But I digress. Your comments take this discussion to a higher level, that we need to be more proactive about our health. There’s plenty we can do. I’ve been reading increasingly that three substances are responsible for many of our health ailments: sugar, salt and red meat. We can also add processed foods to the list, since they contain plenty of sugar, salt and fats. I’ve been gradually cutting back on salt and red meats, as well as processed foods. But it’s tough to do in our culinary culture. America is the land of Junk Food! It’s cheap, quick, and let’s admit it, a lot of it tastes really good. That said, genetics do play a big part. Hypertension runs in my family. I was doomed at birth. I also have a mildly enlarged heart on one side, which I’ve been aware of since my 30s. I inherited that from my mom (still going at 91) and my grandmother, who died at 90, almost 91. My wife is slim and takes good care of herself, but still found out she’s a type II diabetic a few months ago. But her father was also a diabetic, so she was similarly doomed. Meanwhile a friend of mine, who takes exceptional care of himself, recently found out he has afib. He’s in his 50s, but his father had heart issues, so this isn’t a surprising outcome. Another friend from high school found out he had hypertension at 26. He was slim and athletic and you’d never know from looking at him that he’d ever have that problem. But these are the situations that create that medical dependency. And brings us to these discussions of finding alternatives. We have to keep doing that, as well as being proactive in managing our health. It becomes even more important as we get older. I write these articles to share my own discoveries, but also to solicit strategies from others. In the end “we” are all we have, and the best thing we can do is share our successes, as well as warnings of what isn’t working. Kevin what you are describing is basically what the separate drug coverage plans for those of us on Medicare get. I get that card, you mentioned plus a listing of where I can get my prescriptions. I chose to go to CVS because of location availability to me. Where I could save going elsewhere, I would spend for transportation. I also get a chance yearly to review coverage and if my medication is not covered at that point I can change to one that does. But you can avoid this by making sure your doctor prescribes medication that will be covered, Whoever does the billing and sending prescriptions at your doctor ‘s office can help as they know the exact information. They the most helpful for all kinds of billing issues. With CVS, as I have been with their program many years, if you enroll with them, they monitor your prescriptions for interactions, and will let you know if you can or cannot take together. Each new prescription, before picking up, you can either talk with local pharmacist or call the 800 number. I prefer a face to face interaction plus they do give you every time a sheet with prescription of any side effects to watch for. Like you I take blood pressure and cholesterol medications , part of the aging process. Because I was aware of the side effects that you should let doctor know about, I switched blood pressure medication early on because of extreme itchy rash. Most of those medication for blood pressure have similar reactions in side effects but you have use the one Best for you., with least reaction. Yes being involved in cost and types of drugs (prescriptions) taken is very important. One needs to understand and control the costs. It also helps as one ages to get someone to work with you so you are not over medicated. Thanks for bringing up and important topic. Hi Maria Rose – Thanks for bringing up CVS, because they’re the preferred provider under our new plan. I’ve always wondered about drug interactions. They put you on multiple meds, and I’m not always sure the interactions are well understood. I don’t do well with meds in general, and even avoid cold meds for that reason. Some blood pressure meds over the years have caused me to either feel weird or to get stomach cramps. It’s good to know that we can talk with someone at CVS about these things. And of course, our hospital nurse coordinator has been a godsend in helping to sort all this out. She even admitted that it’s all incredibly complicated even for her, which made me feel better about my own ignorance. I sometimes feel like a kid on a constant learning curve trying to absorb it all. And once you do, the rules change. I guess it’s easier to charge us more when we don’t understand what’s going on. It makes me think that healthcare isn’t meant to be understood. Or am I just being paranoid? AS one who takes medication for same problems (and i hate to have to take them), I made sure to ask everything I could about the medication, especially side effects and how to take them and when to take them. By asking these questions, I avoided problems by blindly ingesting the pills. I knew what side effects meant I should inform the doctor immediately. (like you stomach problem and my rash). I see my doctor every three months to moniter my progress and have an open discussion with him. He realizes I will question why I have to take medication so he explains better to me. I especially watch for any that will effect my heart functioning properly, which is why I make the effort to walk daily whatever the weather for 30 minutes. That was tough right after we got 12 inches here in my area and people didn’t shovel their walks because they got an extended weekend with school closing. So I had to shovel a path for myself just to walk a block from the house I live in to the corner and I live in a city. You can tell by the way people shovel whose the homeowners and who’s the tenants. The tenants only clear off their car. What’s even funnier and sad is that only the older people go out to shovel earlier, the younger ones wait. But I deviated from topic on hand. Yes we should get the best drug prices for our money just like anything else. There’s enough profit built into the price for the drug companies. Take whatever help you can get to keep your costs down. I’m with you on the exercise thing. I live in New Hampshire where the weather is nearly savage four months out of the year. So 8 months I walk outside, and 4 months at the mall, 2+ miles just about every day. Of course, getting to the mall when there’s a foot of fresh snow on the ground isn’t always possible, and sometimes the mall is closed. I also have a gym membership that I need to dust off and actually use, but time is short, and excuses abound. I’ve seen what you’re describing about young people with the snow. I live in a condo where we have a snow removal service. But that service is contingent on everyone moving their cars. True to form, the youngest residents are the slowest/most reluctant to move their cars. It’s like they think the world will always wait for them. A snow day means a sleep in day. They come out of the house at noon, decked out in their finest pjs, eyes half open, and v-e-r-y casually clean off their cars while the plows are rolling. There’s no concern for the bigger picture. It’s weird…young people are simultaneously the most idealistic members of society, but also the least cooperative. I wish they would see that.